Your Justice Or His Peace? 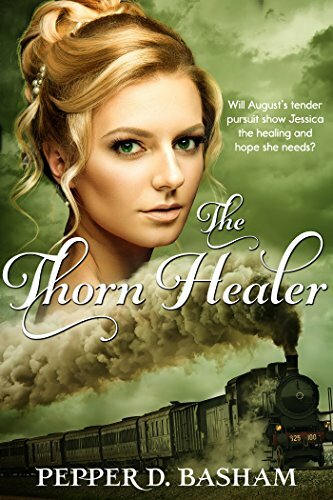 The Thorn Healer by Pepper Basham is a historical romance. It is the third book in the Penned In Time series but can be read as a stand-alone. Set in the final year of World War I, fact meets fiction in this epic read. There is the theme of trust – trust in God and trust in men. An alien intern camp in the small American town is met with fear and dislike. People distrust the Germans because of their experience in war. Prejudice is rife but not everyone should be tarred with the same brush. War breeds bitterness. Bitterness will eat away at a person. “The only thing bitterness does is change you, not Him.” Feelings of bitterness need to be handed over to God. Lives need to be surrendered to God and committed to His plans. People returned from war changed. They had seen things they could not ‘unsee.’ They bore the scars of battle. “War left many scars. Unseen.” Not all scars were visible. Many returned with mental scars. Now we know it as PTSD but then it was called shell shock. People were broken but “Nothing is broken that cannot be restored.” God is the God of restoration. In Him all things can be made new. There is a broken down chapel in the novel. This can be seen as a motif for the broken lives. Pieces need to be put back together. Each broken piece is a treasure whose beauty is restored when joined with other broken pieces. The novel has the theme of taking care of the widows and orphans. There are some truly adorable children in the novel. Young Jude was particularly charming with his child-like observations. This was my first novel by Pepper Basham and what a treat it was to read. My emotions were twisted this way and that, particularly towards the end when I literally gasped out loud. The Thorn Healer is a poignant read that certainly gives God the glory for His steadfast faithfulness. A wonderful offering from a new (to me) author. I am SO glad you enjoyed The Thorn Healer. It’s going to be interesting (should you read my other historical books) to see what you think of the characters you meet before this book. I’ll be really curious of your thoughts!